KELLIHER — The church of St. Vladimir the Great is the second church of the parish. The first parish church was a cruciform wood constructed domed structure which was moved in 1951 from the parish at Bedfordville to a site, purchased for $350, in northerly Kelliher. The church was blessed in 1920 by Bishop Nicetas Budka. It was dismantled m 1967 and its salvaged material was used in the construction of the present church. The second church is on the original church site in Kelliher. It is a rectangular brick structure, 84 x 36 feet, on a high basement and has a gable roof. In the interior, the walls are finished with wood panelling while the ceiling follows the contour of the roof and is supported by a series of wood beams. The church consists of three principal areas which are the elevated sanctuary with the main altar and two adjoining sacristies, the nave in which wooden pews seat approx. 200 persons, and a vestibule. A choir loft is above the vestibule. The basement serves as a parish hall and contains a well equipped kitchen. The structure has electricity and central heating. 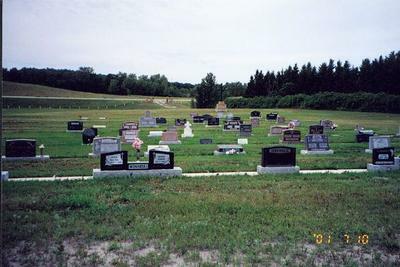 Construction costs, totalling $54,000, were covered by private donations, parish fund raising projects and a $2,000 grant from the Catholic Extension Society. Chief contractor was W, Mazden of Ituna. The first Divine Liturgy in this church was celebrated on December 24, 1967 by Rev. Simeon Ivanochko, CSSR, Bishop Andrew Roborecki blessed the church on July 23, 1972. 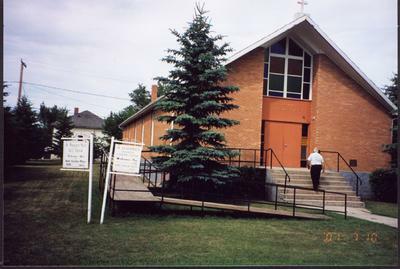 The parish at Kelliher was formed in 1950 and prior to this date the parishioners belonged to neighbouring parishes. During its formation, the parish counted 16 families; in 1967 it registered 68 families and in 1975, 30 families. The parish in 1976 was under the directorship of Rev. Simeon Ivanochko, CSSR, pastor, Harry Moleski, Walter Winnisky, Nick Petras, Walter Bernakewitch and Russel Moleski. 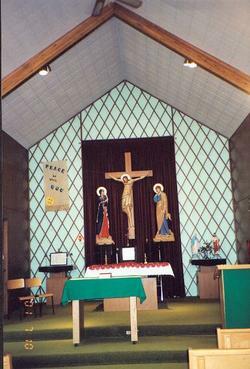 The Ukrainian Catholic parish of St. Vladimir at Kelliher is under the pastoral charge of Ituna.